City had played Hartlepool on the Friday night before this, so me and a few friends decided to go to watch Leeds' relegation battle against Luton Town. 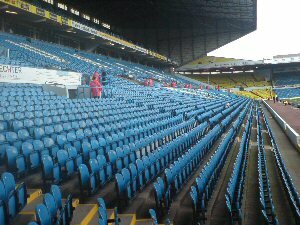 There's not a lot to do around the ground, a few corner shops and a McDonalds are all that surround Elland Road, so we went to get our tickets with no help from signposts or anything telling us where the ticket office was. 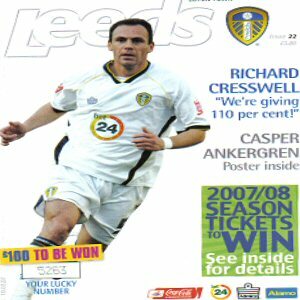 After eventually finding it, we waded into the club shop, and again there was nothing in there other than a programme that took my interest. With the turnstiles opening at 1pm and Grundy saying that there was a lot to do inside the ground, I decided to go inside and was completely unprepared for the mechanised turnstile system. Getting inside and there was far from a lot to do, just the usual canteen, toilets and a TV showing an FA Cup final against Arsenal from the 70s, so I decided to go inside the seated area and have a look around. 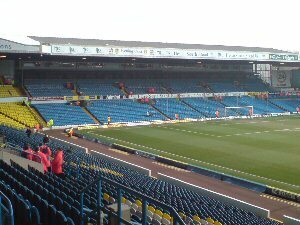 I admit to being highly disappointed, I had been expecting a really nice modern ground, but Elland Road didn't feel like it was supposedly one of the best grounds outside of the Premiership. The stand was also fairly shallow and despite being more than half way up the stand, the view wasn't exactly the best. This was in the main stand where the upper tier was closed, not helping the atmosphere. The stand opposite seemed like a few that you would see in the lower leagues, with the Revie Stand not exactly being something to shout about either. The stand behind the other goal was also a fairly disappointing stand. 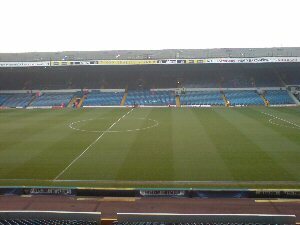 If you take the main stand out of Elland Road, it really starts to look like a below-average ground. The leg room was also a joke, which certainly didn't help my opinion. One of the saving graces though about the day was the fantastic atmosphere that saw 3 out of the 4 stands chanting at once. Unfortunately this seemed restricted to when they were winning, maybe this was down to the tense feeling of an inevitable relegation, but it was also the same when I went with Man United and Leeds were 3rd in the Premiership. 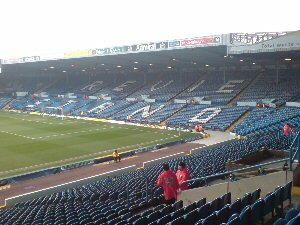 Overall, Elland Road isn't an awful ground but it is highly over-rated and I highly doubt I will ever go to a game at Elland Road from now on that doesn't involve Lincoln.